Samantha Lee/Business InsiderThe Peak Pegasus’ long journey. 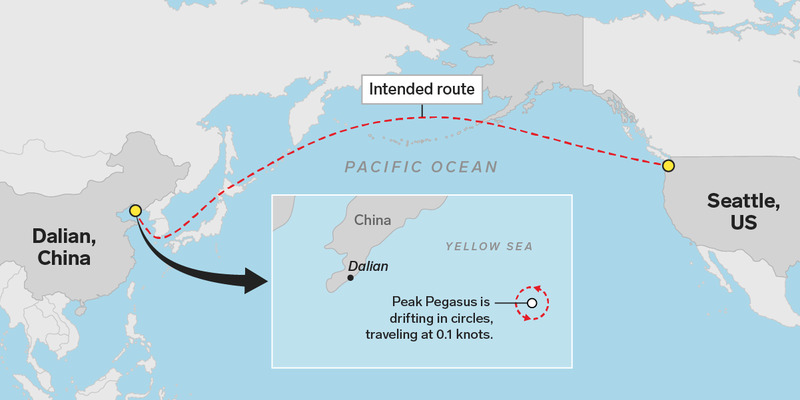 The Peak Pegasus became a symbol of the US-China trade war after it missed tariff deadlines and was forced to drift off the coast of China for over a month. It has finally docked at the Chinese port of Dalian and was offloading its soybean cargo on Monday. Chinese state grain stockpiler Sinograin agreed to pay the extra tariff costs, to the dismay of some Chinese taxpayers. A ship that was left drifting off the coast of China for over month due to the trade war between China and the US finally docked on Monday, Reuters reported. The Peak Pegasus docked at the Chinese port of Dalian and has been offloading its soybean cargo, worth over $US20 million. The vessel became a symbol of the US-China trade war when it failed to reach China before both Beijing and Washington imposed new tariffs on each other last month. Those tariffs included soybeans and the vessel was forced to spend five weeks waiting off the Chinese coast as the owner of the cargo was unwilling to pay the costs. It has now become one of the first major US soybean shipments to incur the new tariffs imposed by Beijing in July, Reuters reported. Chinese state grain stockpiler Sinograin bought the shipment and has agreed to pay the extra 25% in import tariffs, which adds translates to $US6 million. Comments on Chinese social media platform Weibo pointed out that Sinograin is state-owned and paid for by the taxpayer, meaning that in this case, the Chinese people have subsidised their own tariffs. “Isn’t Sinograin state-owned? Who is this tariff hurting? Eventually it is us paying the tariffs and it’s us being sanctioned!” one Weibo user said. Sinograin said the ship was delayed by port congestion despite reports that there hadn’t been any major backlogs or blockages since June. Another ship carrying US soybean cargo, The Star Jennifer, has also been waiting off the Chinese coast for weeks. Soybeans are the top US agricultural export to China. They are used in cooking oil, biodiesel, and meal for livestock. Annual soybean trade between the two nations totalled $US12.7 billion in 2017. Last week, the US announced it would begin to impose tariffs on another $US16 billion worth of goods from August 23 and Beijing said it will respond in equal measure.